Shocking news strikes the NBA world, as the former teammates are reunited in Cleveland. Dwayne Wade reportedly signed with the Cleveland Cavaliers on Wednesday, September 27, 2017, after being bought out for a one-year $2.3 Million deal. The two superstars (James and Wade) are united once again. 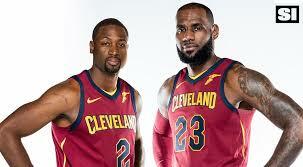 The pair last played together in 2014, and it’s said that Lebron and Wade are excited to be reunited. The 2010-2014 Dynamic Duo will be brought back and it’s expected to be deadlier than before, raising the cavaliers up in NBA super status. The duo will bring a strong competition for the new big three in Oklahoma: Russel Westbrook, Paul George, and Carmelo Anthony. A most intense season is arriving, and the biggest battles are between the Golden State Warriors and the Oklahoma City Thunder for a spot in the Finals, whom will more than likely be going head-to-head with Cleveland for a Championship with LeBron and Dwayne for their 4th Ring.